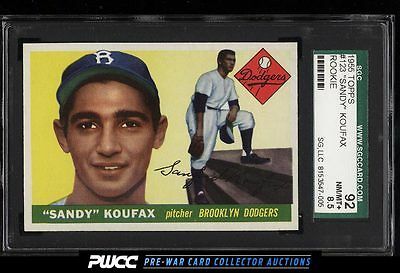 A shockingly high grade an altogether astonishing Koufax RC which ranks as the single prettiest example we've brokered in our history! Completely pack fresh and pin-point sharp throughout with flawless print and razor crisp edges. This card looks very much like a MINT card in almost every way. A very agreeable but slightly inexact right to left framing is the only flaw worth mentioning that keeps this card from grading an industry leading '9'. A rock solid and altogether wonderful offering, worthy of the finest collection. One of nearly 20,000 cards, lots, and sets up for bid in our 7th Auction of 2016. Click on the link above to view the other PWCC auction lots.